Introduction: The prevalence of falls increases with age and with the level of frailty associated with aging. With demographic aging, it is estimated an increase in falls and their consequences. Objectives: To determine the prevalence of falls and their consequences. Methods: Quantitative, cross-sectional and descriptive study. Performed in a probabilistic sample, randomly selected, with an estimated frequency of 50% and with an acceptable margin of error of 5% and a confidence level of 95%. Results: The study was performed in a sample of 321 elderly people, 54.5% of whom are female and 45.5% are males and with a mean age of 76.11 ± 6.79 years. The prevalence of falls was 45.5% in the 12 months prior to data collection, and 21.5% in the last 3 months. Among the elderly who fell, 68.5% suffered injuries, abrasions (32.9%), fractures (16.4%) and bruises (15.8%). Conclusions: Falls are a problem in the elderly and often cause physical consequences. We recommend studying the impact of falls in the elderly from a psychological and social aspect. American Geriatric Society & British Geriatrics Society. (2011). Summary of the Updated American Geriatric Society/ British Geriatrics Society Clinical Practice Guideline for Prevention of Falls in Older Persons. Journal of the American Geriatrics Society, 59(1), 148-157. Beaglehole, R., Bonita, R., & Kjellstrӧm, T. (2003). Epidemiologia Básica. Lisboa: Escola Nacional de Saúde Pública. Conselho Internacional de Enfermeiros. (2011). CIPE® Versão 2: Classificação internacional para a prática de enfermagem. Lisboa: Ordem dos Enfermeiros. Cruz, D. T., Ribeiro, L. C., Vieira, M. T., Teixeira, M. T. B., Bastos, R. R. & Leite, I. C. G. (2012). Prevalência de quedas e fatores associados em idosos. Revista de Saúde Pública, 46 (1), 138-146. Fernandes, A., Nogueira, M. N. G. & Teles, P. (2014). Risco de Queda dos idosos, de uma Unidade de Saúde Familiar. Revista Investigação em Enfermagem, 92(9), 68-75. Rodrigues, R. A. (2013). Prevalence of falls among frail elderly adults. Revista de Saúde Pública, 47(2), 266-273. Instituto Nacional de Estatística. (2018). Estimativas de População Residente em Portugal 2017. Lisboa: INE, IP. Instituto Nacional de Estatística. (2016). Inquérito Nacional de Saúde 2014. Lisboa: INE, IP. Moyer, V. A. (2012). Prevention of falls for Community-Dwelling Older Adults: U.S. Preventive Services Task Force Recommendation Statement. Annals of Internal Medicine, 3(157), 197-205. Paz Jiménez, J., Palomino Moral, P. A., Frías Osuna, A. & Pina Casaso, R. (2014). Acidentes en personas mayores: las caídas y su prevencíon. In Martinez Riera, J. & Del Pino Casado, R. Manual Práctico de enfermeria comunitária. (pp. 11-17). Madrid: Elsevier. Pinho, T. A. M., Silva, A. O., Tura, L. F. R., Moreira, M. A. S. P., Gurgel, S.N., Smith, A. A. F. & Bezerra, V.P. (2012). Avaliação do risco de quedas em idosos atendidos em Unidade Básica de Saúde. 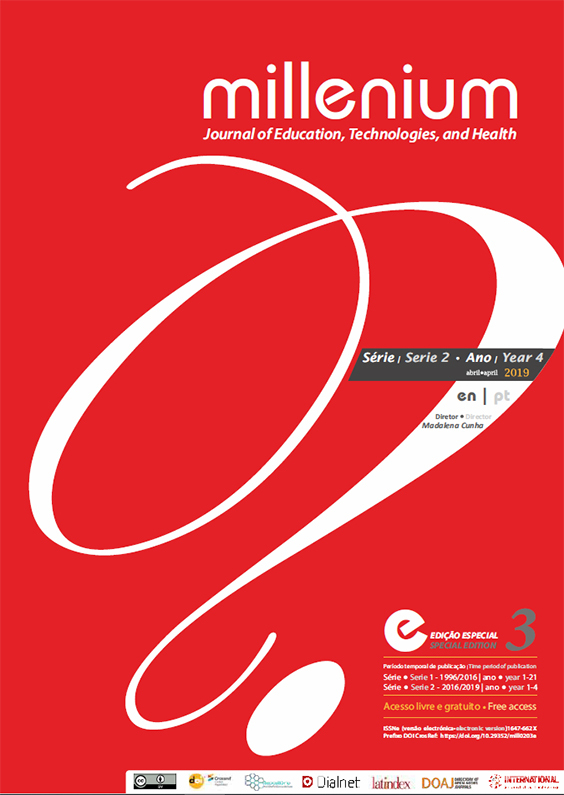 Revista da Escola de Enfermagem da USP, 46(2), 320-327. Portugal, Ministério da Saúde, Direção-Geral da Saúde. (2012). Programa Nacional de Prevenção de Acidentes. Projeto COM MAIS CUIDADO, de prevenção de acidentes domésticos com pessoas idosas: Manual e Formulário de Candidatura. Lisboa: DGS. Soares, W. J. S., Moraes, S. A., Ferriolli, E. & Perracini, M. R. (2014). Fatores associados a quedas recorrentes em idosos: estudo de base populacional. Revista Brasileira de Geriatria e Gerontologia, 17(1), 49-60. Terroso, M., Rosa, N., Marques, A. T. & Simões, R. (2014). Physical consequences of falls in the elderly: a literature review from 1995 to 2010. European Review of Aging and Physical Activity, 11(1), 51-59. Tripathy, N. L., Jagnoor, J., Patro, B. K., Dhillon, M. S. & Kumar, R. (2015). Epidemiology of falls among older adults: A cross sectional study from Chandigarh, India. Injury, International Journal of the Care of the Injured, 46(9), 1801-1805.